Blue Bink Books: Welcome to the new blog of Blue Bink Books! Hi there! Thanks for taking the time to visit. 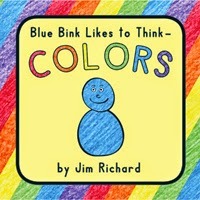 I'm Jim Richard, author and illustrator of the Blue Bink book series. Visit www.binkbooks.com to learn more. Blue Bink Likes to Think! I have so much to say about the books that I can't fit it all on FaceBook - I don't want to inundate everyone with too many posts. So I'm starting this blog to give a home to this extra content. Here's the main thing: these books are my dream. I couldn't hope for more than to see my books in the hands of many, many kids. To write and distribute these and many more books in the coming months and years would be an awesome privilege. It all started on December 1, 2001. I was working as a shipping clerk in a warehouse and while I was boxing up some products, the words "Blue Bink likes to think" came into my head. I'd been wanting to write books for my kids for years with no great ideas. I thought, "Here's an idea I just might make something of!" The next day, I wrote the rough draft of Blue Bink Likes to Think - Colors on my lunch break. The words came easily but I knew the illustrations would be another matter. I didn't think I could do them. I wondered who I might find to help me. Being too excited with my new endeavor to wait, I made a (very) rough draft of the book with hand-drawn illustrations. I don't think it was very good, but it gave me a starting point to work from. My big breakthrough came a couple days later when I drew Bink's face in Adobe Illustrator. I thought, "Hmm, I might be able to do this." I thought the coolest way to color him in would be to use crayon. But I didn't want to print out the line drawing, color it in, and then scan it back into the computer. So I had a bright idea! I covered an 8.5 by 11 sheet of paper with blue crayon and scanned that into the computer. Then I cut out the shape I needed in Adobe Photoshop and colored in my drawing. I liked the effect and have used that process ever since. Remember how I said I wrote the rough draft on my lunch break? Well, the illustrations were another story. They took me months and months and months! Long story short, (too late!) it was a year after having the idea that I held in my hand a printed copy of my first book.